When winter arrives and the cold damp weather settles into our area, you want to preserve as much heat indoors as possible. A study by the Department of Energy has shown that heat loss of up to 44% occurs through poorly insulated homes. Heat loss could have profound effect on your household’s comfort and utility bills. 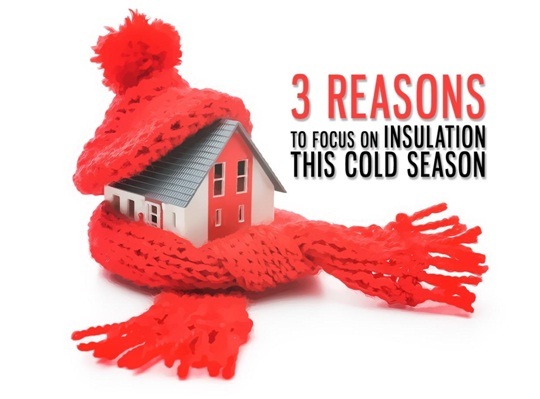 Tedrick’s Roofing looks at three big reasons you should consider upgrading your insulation as soon as possible. 1. It will make your home more comfortable. Forty-four percent heat loss is enough to make your home chilly. That chill can be a source of discomfort for everyone in your household. Everyone knows that warm air rises, so it makes sense to block its obvious escape route, which is through your attic. . With the proper application of insulation, you keep heat inside to ensure your family’s comfort. This is highly connected to comfort. As that heat escapes through your home and temperatures drop, you rely more on artificial means of heating your home to stay comfortable. This drives up both your energy and gas bills monthly. With proper insulation, you minimize what you have to spend on these artificial means because your home will stay warm naturally. In addition, your Des Moines roofing system will last longer. 3. It will protect your roof. Whether you are talking residential or commercial roofing in Auburn, there are many adverse effects associated with lower temperatures. One of these is ice dams, which form when your roof’s temperature drops by a significant degree. Not only can these damage your roof and its underlying support, as ice dams cost much to remove. With proper insulation, you avoid these kinds of problems. Invest in the one component of your roofing that will take care of your comfort, your energy expenditure, and your roof—get new insulation today. With over 25 years of experience, you can count on Tedrick’s Roofing to make sure that your roof is prepared for the coming season and beyond. Call us today at (204) 824-3440 and we will be happy to discuss the best options for your home and roof.